Oklahoma City Thunder combo-guard Russell Westbrook added another component to his repertoire this season: triple-doubles. While his scoring tantrums include setting three new career-highs in points (45, 48, 49), Westbrook also sits at 11 triple-doubles for the season to join Grant Hill, Jason Kidd, Larry Bird and Magic Johnson as the last players to have double-digit triple-doubles in a single season. Career-high in points (27.8), assists (8.5), rebounds (7.3) and steals (2.1) has made it hard to not mention his name among the best point guards, if not players in today’s game. Westbrook was bound to reach such accomplishments when he shocked the NBA in the 2013-14 season by recording the second fastest triple-double in NBA history. In 20 minutes, his stat line read 13 points, 14 assists and 10 rebounds; only three minutes shy of tying a record made by Jim Tucker in 1955. On his first triple-double of the season and the ninth of his career, 15 rebounds, 17 points and a career- high 17 assists, Westbrook became just the fifth player in NBA history to record a 15-15-15 in a game. Each month has marked something special for Westbrook, reaching platforms that haven’t been touched in years. The 2015 NBA All-Star Game MVP broke the all-time record for points in a half, 27, and was one point shy of passing Wilt Chamberlain for most points in an All-Star Game. Westbrook’s numbers on February 22, 26 and Feb. 27 made him the first player to record three triple- doubles in a row since Lebron James in 2009. By posting five games with at least 30 points and 10 assists in February alone, Westbrook became the third person since the 2000s to join the 30- 10 club. James and Dwayne Wade are the other two players who’ve accomplished this feat. His March averages of 31.2 points, 10.3 assists and 9.1 rebounds put him in the same company of Oscar Robertson as the only players to do so with at least 10 games played. In the March 4 game, Westbrook became the first player since Michael Jordan to record four consecutive triple-doubles and the first player since 1989 to record back-to–back triple-doubles with at least 40 points, also recorded by Jordan. His 49 point, 16 rebound and 10 assist effort also tied him with Bird for the most points scored in a triple-double stat line. Westbrook was two rebounds and three assists shy of a triple-double in his next competition to end his streak at four but he finished the March with two more triple-doubles under his belt. 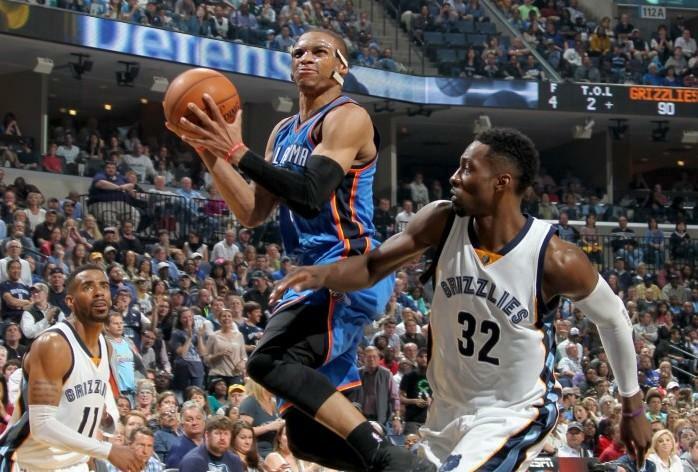 April marked two more triple-doubles for Westbrook, both with double digits in points, rebounds and assists. It’s been made clear that with or without former MVP small forward Kevin Durant, the former under-recruited UCLA product can produce big stat lines despite his depleted team.